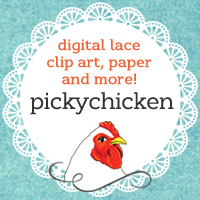 Create your own gorgeous invitations, scrapbook pages, paper crafts and more with graphic resources from pickychicken. Vintage lace clip art, faux gold foils, gold-black-white, burlap and lace, fairy lights, damasks, florals, ... we have many styles to choose from! Photographers also use our digital papers for photography backdrops, and clip art as photo overlays. Take a look around and see what you are inspired to make!